DiabloSport has expanded the Reaper Stage 1 Kits to now include the Trinity 2 EX Platinum Tuner. The Trinity 2 is the quintessential in-cab tuning and monitoring solution that there is in the marketplace. 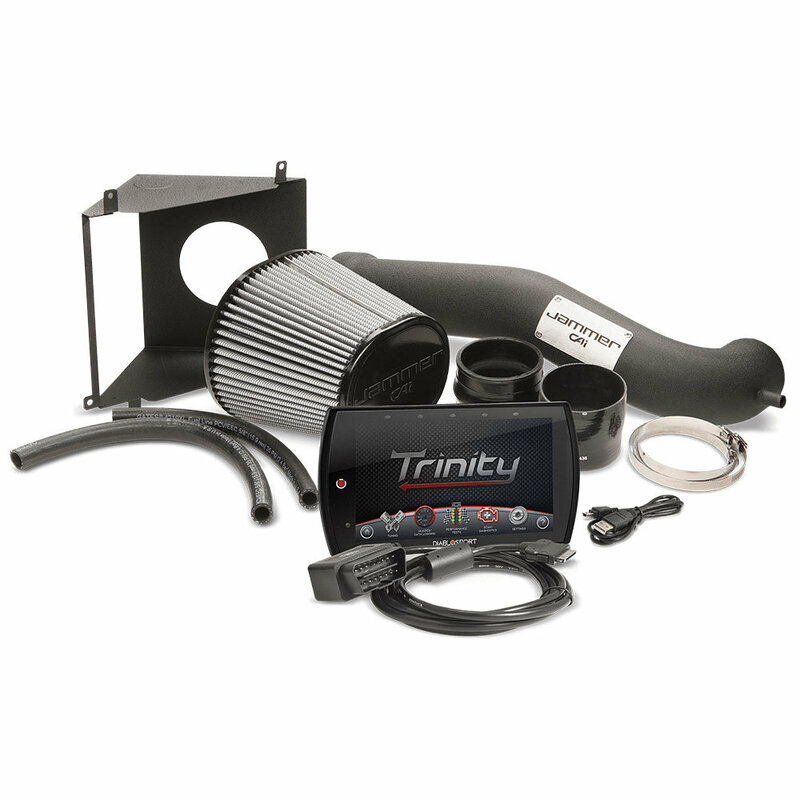 The combination of a high quality cold-air intake and the Trinity 2 tuner, make for a cost efficient, high performance upgrade, without trying to build a kit piece by piece. Designed to work together perfectly, the Reaper kits are trail tested and have produced excellent results.You can be assured that this powerful combo will give you more power & improve gas mileage along your travels whether it be off or on road driving. Jammer Intake: The Jammer Cold Air Intake moves the intake box away from the heat of the engine to let cooler outside air flow into your engine for combustion. The Jammer cold air intake offers an easy to install solution to provide cooler air at a faster rate without sacrificing filtration. The cooler air charge basically equates to more oxygen and more performance. You will not only experience raw power improvement but an improvement in mileage performance as well. Trinity 2 EX Platinum Tuner: Performance tuning for mileage, towing, daily driving, and performance.You will have access to a nationwide network of CMR custom tuning dealers who can build tunes for your specific ride on a dyno or by using the built-in data logging features of the Trinity. Now you can have great tunes for now, and custom tunes for when you take your ride to the next level with the Trinity T2 Platinum. This Tuner builds great power, improves mileage potential and drivability whether you’re on the streets or the trails and anything in between.